Rowena Potts first availed of self-storage a number of years ago after her father died and believes it was the best answer to a difficult situation. Following her father’s passing, Rowena and her two siblings were concerned about their mother living alone in a big property in another part of the country far away from her children. When the time was right Rowena’s mother sold her home and moved to Dublin to be closer to her three children. 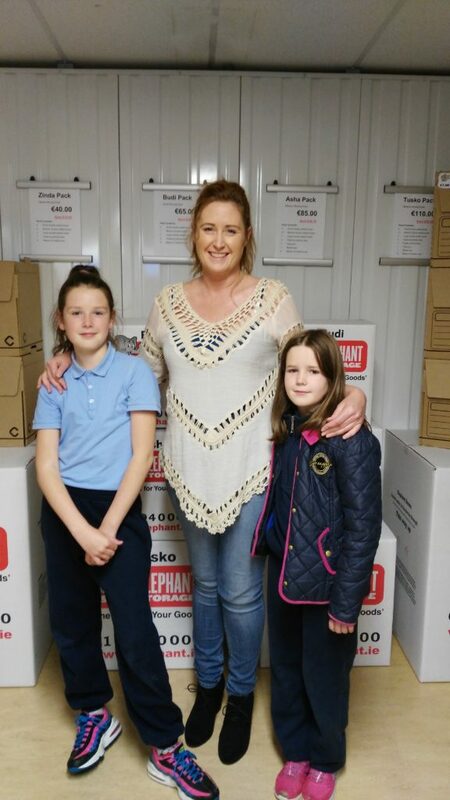 While downsizing there was still a number of sentimental items she did not want to part with and this is where Elephant Self Storage offered the perfect solution, securely holding a number of items while Rowena’s mother got back on her feet. The following year Rowena and her partner secured a sale on their home and were ready to make the move to their dream property. At the 11th hour the unthinkable happened and the bank withdrew their mortgage application leaving them almost destitute. With no other option but to turn to rental accommodation, the family had to move almost all their items into storage until they found a new property to purchase. Throughout this time Rowena credits the Elephant Self Storage team for their professionalism, enthusiasm and dedication. Rowena states: “It was a very stressful situation. I had just asked my mother to sell up and move in and now when everything was in place the rug was pulled from under us. Everything we had was gone, it was very upsetting, but the girls in Elephant Self Storage managed to take the stress out of a very stressful situation. No problem was too big or small and they really did everything they could to help us – I’ll never forget that”. In recent times Rowena’s mother suffered a stroke and has moved into a residential nursing home, meaning more items now need to be stored away. “Following my mother’s illness we’ve increased in size again. The team have been fantastic and have been nothing but supportive the whole way through”. Rowena highly recommends Elephant Self Storage for the high quality service provided by the entire team. She believes that self-storage was a fantastic solution to her situation and gave her family the space to have a better quality of life while everything got settled once again.